Over the last 34 years, many an owner sitting across the design table from Frans Heesen must have wondered what the yard founder would put on his own yacht. Heesen’s expertise ranges from the detailed technical knowledge of a former joiner, to the whole-concept understanding of a yard director and the nous of a businessman who has nurtured his brand’s reputation for quality. His understanding of yachts is broad and deep. For years his roles at Heesen meant he did not have time to buy his own superyacht and satisfy the curiosity of his customers. It was not until 2008 that he sold the company, turned his mind to the best way to enjoy semi-retirement as a brand ambassador – and found an obvious solution. Heesen and his wife Petra initially set their sights on a 37 metre Heesen yacht, a size limit determined by Mrs Heesen to minimise crew and maximise privacy. 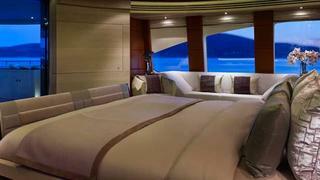 But before work had begun, a part-complete 44 metre yacht became available at the yard. Heesen couldn’t resist the opportunity to up-size, persuaded his wife, and the 4400-series semi-displacement My Petra was delivered to them in June 2009. Thus the 47 metre Lady Petra was ordered – at Heesen Yachts, naturally. 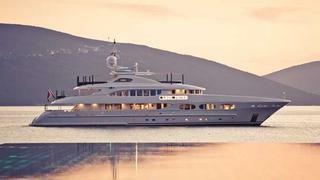 Delivered in June 2012, she is the seventh in the award-winning 47 metre full-displacement class. The length, beam and Heesen engineering of the class makes them sister-ships, but there are differences in their layouts and their Omega Yachts superstructures. In other words, there was scope, within limits, for the Heesens to shape Lady Petra. They chose a steel and aluminium, full-displacement yacht because after the semi-displacement My Petra, they wanted to maximise the larger spaces for the family. For the exterior styling Heesen chose a vertical wheelhouse windscreen and a mixture of straight, masculine side-windows and elliptical ports. Together with the pelican bow and balanced deck stacking, these touches give the typical Heesen look a classical accent. 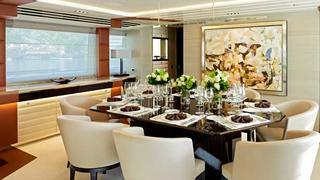 Inside, the layout was tweaked in conjunction with the yacht’s interior designer Bannenberg & Rowell. ‘Frans’s boat is pretty unusual among the 47s because at the forward end of the main deck, instead of the conventional owner’s cabin, there is a media/family room. 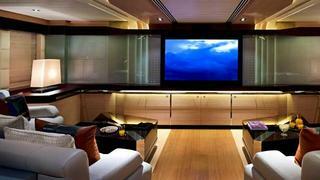 It’s got a 100-inch flatscreen television, custom designed sofas and coffee tables, a work area and a treadmill. 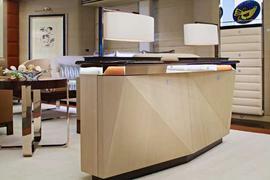 It’s a great hang-out area for the whole family,’ says Dickie Bannenberg, co-director of Bannenberg & Rowell. This area gives the youngest of the Heesen clan space for fun, and the senior members the rest of the boat for relaxation. The displaced owner’s suite replaces an upper saloon, making the large aft bridge deck a private terrace. The cabin has fabulous views on three sides, and provides a haven of privacy to retreat to. 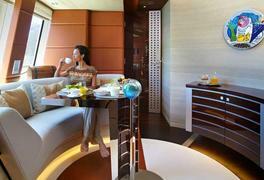 There’s even a small breakfast room to port. The lower deck crew areas were part of the standard layout. Forward are four cabins sleeping two crew members each (the captain has a good sized double aft of the wheelhouse). As with other boats in the class, the mess may seem a little cramped, but in reality the full staff will rarely have time to sit down together to eat. Such limitations have not negatively affected guest areas. Exterior space is generous – apart from the aft bridge deck, there is a large sundeck with awnings aft and forward. This features a relaxed seating area aft, a wet bar and dining table for 10 amidships, and a spa pool forward. Just in front of this is a small secluded seating area. Downstairs, there’s a good-sized main aft deck with a round of fixed seating, leading into the saloon and dining saloon (an open plan space). Forward from the dining saloon, a port door gives the crew excellent access from the well laid-out galley. A door forward on the starboard side of the dining saloon leads into a guest corridor. 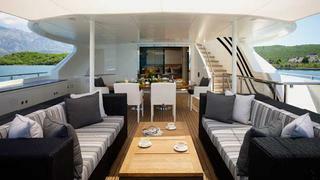 Forward to starboard is a twin cabin with en suite shower, and beyond, the full beam media room. Down the central staircase (with stair lift) four more guest cabins lie amidships – two doubles and two twins, all with en suite showers. Bannenberg & Rowell proposed a “Dutch industrial” design direction. This theme, in part a nod to Heesen’s career in Dutch shipbuilding, incorporates shapes based on industrial equipment and industrial-looking materials. For example, the ends of the owner’s bedhead are inspired by formers – elliptical components of aircraft fuselages; all interior cabin doors have vertical steel panels with holes punched in them; the guest shower rooms have rust effect panels on the floors (in fact a ceramic tile); and the macassar walls of the stairwell and main deck corridor feature vertical steel panels that form a pattern reminiscent of a microchip. To achieve warmth the Heesens wanted the industrial features ‘punches’ in an otherwise neutral, calming palette. The predominant timber on board is a brushed spruce, which is ‘very pale grey, like washed-out oak’, teamed with high-gloss macassar ebony on doors and window reveals. In the saloon the sofas are neutrally toned, and the industrial look boldly stated in the corridors is carried through this space subtly – in a multifaceted console cabinet between the saloon and dining area, and in the angular custom-made dining table with corners ‘cut off’ to allow extra diners. A striking feature in this space is the warm band of terracotta leather that ‘snakes its way over bits of furniture, wraps its way up over the deckhead and really connects the spaces’, as Bannenberg puts it. Also of note is the basin arrangement, with sinks moved from the original layout to face outboard, towards large windows. 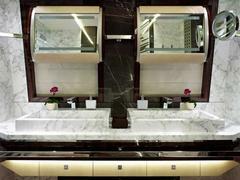 With mirrors displaced, they installed ‘groovy tilting mirror pods’ that can be swung out of the way when not in use. The guest cabins on the lower deck feature pale, muted tones and the industrial theme is carried through with touches of macassar and steel, plus bedside drawers cantilevered at 45 degrees that ‘look as if they are travelling at speed’ as Bannenberg says. 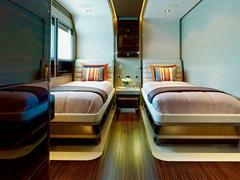 Like the rest of the yacht, the effect is stylish, comfortable and highly individual. Further inside are more traces of Heesen’s influence. The twin MTU 8V 4000 M70 engines, offering 1,160kW each, are smaller than those on My Petra, because as Heesen says, ‘We burned so much fuel on the other one.’ (Although due to the yacht’s greater bulk, they are ‘still burning as much’.). The engine room offers good access and equipment is clearly labelled. The sole engineer can monitor and control systems from touch-screens in the engine room and his small office off the garage. The garage itself contains a jet ski and 6.5 metre Novurania tender, as well as four of the nine Foster fridges and freezers on board for long trips. Heesen chose to remove the compressors for these and group them in the engine room – easing maintenance and reducing noise and heat in living space, particularly crew areas. The top speed is 15.5 knots, with a range of 4,000 nautical miles at her cruising speed of 12 knots – everything the Heesens need. In its performance, exterior looks and the creation of a ‘friendly interior’, as Heesen describes it, the yard and designers have succeeded in creating the yacht that truly fits these owners. But the fact that Heesen, with all his expertise, chose this semi production boat rather than a custom one, is testament to the quality of the product he has helped create. There may be other superyachts with similar engineering, and hulls, but this is most certainly Frans Heesen’s boat. Lady Petra is listed for sale with Fraser Yachts.